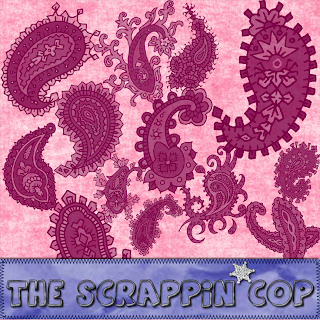 I think you are going to like today's freebie set! I searched for some paisley brushes and found a few (some beautiful ones from Obsidian Dawn and Graphics-Illustrations) and then found a gorgeous dingbat font from House of Lime. I purchased Paisley and Paisley 2 for commercial use and was given permission from Lime to make a brush set from some of the characters. Very generous don't you think? She just asked (I think it's a she, but don't quote me- the email was just signed Lime) that I don't include all of them. She really has some fabulous dings and fonts on her site and if you haven't checked it out you definitely should! The brushes actually took quite a bit of time to create because I had to fill all the nooks and crannys with black and grey so it was't just an outline of the paisley. So here is the preview of these gorgeous paisley brushes. And they are HUGE, over 2000 px per brush so you can scale them very small and retain all the details. Enjoy! And I'm glad so many of you have downloaded and are enjoying the border brushes! These are adoreable, lol thanks again for sharing with us.. Thank you! Your blog post will be advertised on the DigiFree Digital Scrapbooking Freebie search engine today (look for timestamp: 20 Jun [LA 03:34am, NY 05:34am, UK 10:34am, OZ 08:34pm]). Absolutely gorgeous! Thanks so much for sharing with us!!! These are great. Thanks a bunch! Thank you so much! I just ***LOVE*** paisley! Very Pretty! Thank you for sharing your hard work!